CLICK HERE for Rocky 2011 Program Book (.pdf). Posters start on page 47. P49: A Comparative Analysis of Knowledge-Based Gene Prioritization Methods: Is the Supply Greater Than the Demand? P64: Quantitative Data: Where are they Hidden in Biomedical Literature? The next Rocky conference will be announced here soon. • Dec 01: Online registration has closed. Onsite registration will take place Thursday, December 08, 11:00 AM. 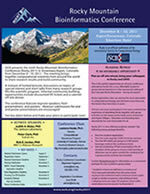 Welcome to the ninth annual Rocky Mountain Bioinformatics Conference, a meeting of the International Society for Computational Biology (ISCB). The organizers hope that you enjoy the program, and find the conference a productive opportunity to meet researchers, students and industrial users of bioinformatics technology. The Rocky series began nine years ago as a regional conference, and has grown into an international program with a spotlight on regional development in the computational biosciences. The presenters of the Rocky conference are scientists representing a broad spectrum of universities, industrial enterprises, government laboratories, and medical libraries from around the world. The meeting is a chance to get to know your colleagues near and far, seek collaborative opportunities, and find synergies that can drive our field forward. "Really, really enjoyed the keynotes this year - great mix, great speakers." "As a student who was originally trained in the biological sciences, it was simply delightful to meet many computational biologists, statisticians and computer scientists who are actively designing the tools on which I rely very heavily to do my work. I received good feedback, suggestions, and advice on how to move my current project forward. The suggestions on how to publish my data were also quite welcomed and I am most grateful. I look forward to attending the conference next year and hopefully doing so with novel data. Thank you." Online registration - Online registration is now closed. Onsite registration will be available starting at 11:00 am on Thursday, December 8. JOIN OR RENEW NOW AND SAVE! Non-members and those whose ISCB memberships have expired will be able to join ISCB through the online conference registration system and immediately receive the member discount for Rocky 2011. You can either join when you register for the conference or do so separately in advance here: www.iscb.org/iscb-membership. In order to qualify for the member discount, your ISCB membership must be paid in full. Those preferring to register at the non-member rate will immediately be offered a free 12-month ISCB membership with their higher fee. Radio frequency (RF) gate cards will be issued with all purchased lift tickets. Please note there is a refundable $5 per ticket fee for the RF card; refunds will be given at the Aspen Skiing Company ticket counters. Tickets purchased on-site at Aspen Skiing Company ticket counters are $100 per day (this is the non-group rate). Lift tickets purchased in advance at Rocky group rates are offered at the following non-refundable prices. Cancellations received by November 9, 2011 will receive a 50% refund. IBM’s Deep Computing organization is the high performance computing organization in IBM Systems and Technology Group. This group is responsible for the strategy, marketing and identification of areas that can benefit from IBM's high end technology. The life sciences is such an area, and IBM is and will continue to bring valued solutions to life sciences. IBM's Research Division is a partner with IBM’s Deep Computing organization, developing the next generation of high performance computers. In addition, the Research Division has many groups investigating numerous application areas in collaboration with IBM's customers and partners. This includes IBM’s Computational Biology Center with IBM’s new Computational Science Center. NEC Corporation (TSE: 6701) is one of the world's leading providers of Internet, broadband network and enterprise business solutions dedicated to meeting the specialized needs of its diverse and global base of customers. NEC delivers tailored solutions in the key fields of computer, networking and electron devices, by integrating its technical strengths in IT and Networks, and by providing advanced semiconductor solutions through NEC Electronics Corporation. The NEC Group employs more than 140,000 people worldwide. For additional information, please visit the NEC home page at: www.nec.com. SomaLogic, Inc. is a privately-held biomarker discovery and clinical proteomics company based in Boulder, Colorado. The company's mission is to use its proprietary Slow-Offrate Modified Aptamer ("SOMAmer") technology to develop enhanced protein analysis tools and reagents for the life sciences community, to facilitate target validation, and to develop and commercialize clinical diagnostic products that will improve the delivery of healthcare by offering timely and accurate diagnostic information to physicians and their patients. Further information about SomaLogic can be found at www.somalogic.com. Biodesix is a personalized medicine company focused on the development of diagnostic products that inform treatment decisions and improve patient care. The Company’s goal is to give physicians more information about the patient and their disease; understanding the clinically meaningful information contained within each patient's molecular profile leads to better care and better outcomes. The Company’s unique approach is based on ProTS®, proprietary technology which exploits the power of mass spectrometry and enables the discovery of specific molecular profiles. Biodesix collaborates with clinical investigators to address critical clinical questions, and partners with biotechnology and pharmaceutical companies to develop diagnostics to select patients most likely to benefit from novel therapies. For more information about Biodesix, please visit www.Biodesix.com. Follow Brush Creek Road for approximately 6 miles. Grayline to and from Denver Airport to Aspen Airport Direct with no stops. 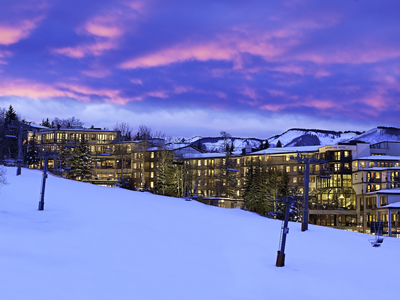 From the Aspen Airport, the Silvertree Hotel will pick up free. Silvertree Hotel - Hotel transportation is provided complimentary to the Silvertree Hotel (conference hotel) from the Aspen/Pitkin County Airport. Advance reservations for the shuttle are not required, a telephone is available at the airport to request shuttle service.